Dronologista: How did you come up with the idea? Jonathan: The main goal of the project was to provide WiFi connection to people on the ground (in disaster areas, where there is no more connectivity), using swarms of flying robots. By analyzing the data collected by the WiFi antenna embedded in the plane, we thought about using this information to localize people and moving the plane around so that the connection is better. Dronologista: Have you been working on it alone or it was a team effort? Jonathan: A team effort. I was working with two people, Stefano Rosati, a postdoc, and Karol Kruzelecki, a graduate student. They helped me a lot to fulfill the project’s goals. Dronologista: How does this system work? Jonathan: The UAV sniff WiFi packets periodically broadcast by smartphone (if WiFi is switched on). The smartphone broadcast so-called “probe requests” to discover which WiFis are in range. We extract the signal power of these packets (RSSI) and use the GPS position of the plane to localize the users. 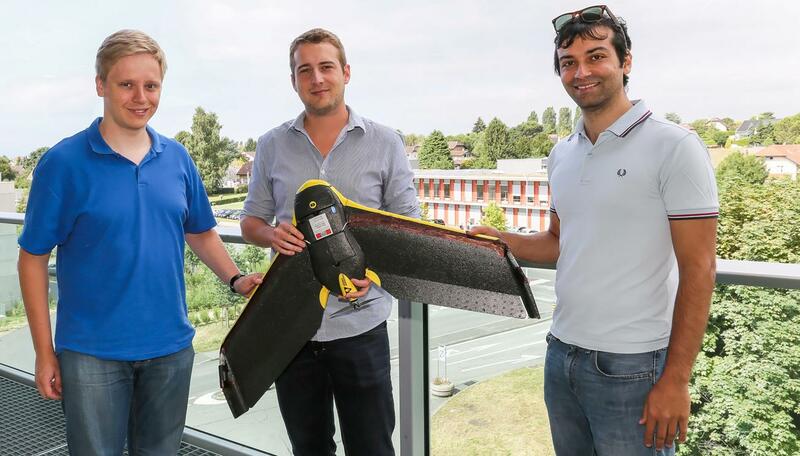 Jonathan Cheseaux and his team with the Sensefly eBee used for the project. Dronologista: Has it been tested, and if yes, how? Jonathan: We flew the UAV around EPFL‘s campus and tried (and succeeded) to find the position of a smartphone randomly placed somewhere on a building with a satisfying precision. Dronologista: What are potential problems? Jonathan: If the WiFi of the smartphone is not switched on, we cannot localize the user. Also the signal can get scrambled by a lot of factors, such as buildings reflecting the signal, weather conditions, plane’s orientation, etc. In the case of an earthquake for example, if the victim is buried under several meters of concrete, the WiFi signal will not be detectable. Also Apple announced that they will randomize the MAC address while sending probe requests in iOS 8, and this will make the localization quite impossible because now we rely on the fact that a MAC address is unique for a user, and can thus fully determine which person we are localizing. Dronologista: Were you contacted by any organization yet? Jonathan: I’ve been invited to the UAV Show 2014 (London), they want me to give a small speech about my project during the conference. I’ve also been contacted by several companies that want to commercialize search and rescue drones. Dronologista: What are future steps for this system? Jonathan: Enhance precision by conducting more real life testing, maybe use GSM data as well (IMSI catcher), but due to legal concern it could be difficult to implement. The real improvement will be to use avalanche transceivers to find avalanche victims. I really want to work on that after my internship. Dronologista: What are other projects you are working on, that you want to share? Jonathan: During my bachelor studies, I implemented a virtual reality project using Kinect and some physics engine. The goal was to project the user in a virtual environment and allow him to interact with [the environment] (shoot a virtual ball, smash a wall), as well as draw interactive shapes with the only use of hand gestures (drawn shapes we bound to the physics engine so that it also falls/bounces etc.). Last semester, I lead a project on Bitcoin trading. We’ve implemented sentiment analysis on tweets talking about bitcoin to probe the market’s mood and used time-series analysis to work directly on the bitcoin stock market. That was a really cool project. I’m going to start my master thesis soon, in which I will develop a smart search engine that will automatically classify documents, display augmented information, context, etc. I’m not sure yet what the project will be exactly, but it is definitely about machine learning. Dronologista wishes Jonathan and his team great success with their projects, and expects to hear more good news about their endeavors soon. And so should you. For further reading check EPFL news, SkyNews, and the Swarming Micro Air Vehicle Network (SMAVNET II) project page.